I’ve spoken about smartphone games a lot recently, mostly because of the release of new Final Fantasy mobile games like Final Fantasy Brave Exvius and Mobius Final Fantasy. My previous smartphone gaming habits involved only one game - Final Fantasy Record Keeper, one of Final Fantasy’s first quality original smartphone games that incorporated familiar RPG and Final Fantasy mechanics into a light experience on the go. I downloaded Record Keeper on the first week of its release so I was able to keep up with its main quests, events and limited edition characters for a good period of time (especially before I dropped my phone two months later). But all good things must come to an end, because recently I’ve stopped playing Final Fantasy Record Keeper completely to the point where I may delete it. For most smartphone games, deleting one is sadly a mere a necessity most of the time, whether it be for clearing memory or just getting an icon off your home screen. But to be deleting Final Fantasy Record Keeper is a little more to me. Record Keeper happened to be released at a time when I’d just moved overseas and was struggling pretty hard for money and had some time before my new day job started. The TV in my apartment had no HDMI ports, so for gaming I had my PS Vita and my phone. When Record Keeper was released, I needed something to entertain me and had the rare opportunity of having time to get really into it. All good things must come to an end though When I fatally dropped my phone two months later, since I’d just moved my life over to another city in another country, it took me two months to get the money together to get a new phone. Not having a working smartphone was completely unexpected so I didn't have a chance to backup my save and my multiple Level 50+ characters and all of my event rewards were completely gone. Once I realised what a tragedy this was, I was pretty upset but since I’d started my job at this point, Record Keeper had served its purpose of keeping me entertained and sane when I could’ve just been at home stressing about my budget situation. Once I got my new phone, I tried really hard to get back into Record Keeper. I wanted to get back up to date with the story and to follow events just like I had before because I still had extremely fond memories of my time with Record Keeper. Now that I was playing with a very different schedule, the commendable constant stream of content that Record Keeper has was too much for me to keep up with. That began my cycle of jumping in and out to collect cool characters and weapons, but never truly catching up with Record Keeper’s content. It’s a great plus that Record Keeper has so much content consistently but for players who weren’t there from the start, the amount of content could also be considered overwhelming. I could never shake the feeling that I’d be doing better if I’d just had those few months without my phone back and it made it hard for me to fully appreciate Record Keeper like I had before. The last time I touched Final Fantasy Record Keeper was a little over a month ago, just before I downloaded Final Fantasy Brave Exvius. I was in the midst of giving up doing events in Record Keeper so I could catch up on the dauntingly large amount of main quests I'd missed. Events used to be one of my absolute favourite parts of Record Keeper because of the fun collectible characters and more recently the addition of costumes from my favourite Final Fantasy games. However as I mentioned in my impressions for Record Keeper, its story premise is extremely vague and mostly serves as context rather than an actual story. I love JRPG gameplay but by even with the wealth of mechanics and things to do in Record Keeper, the repetitive mechanics weren’t pushing me forward without any story. That's where Final Fantasy Brave Exvius comes in. 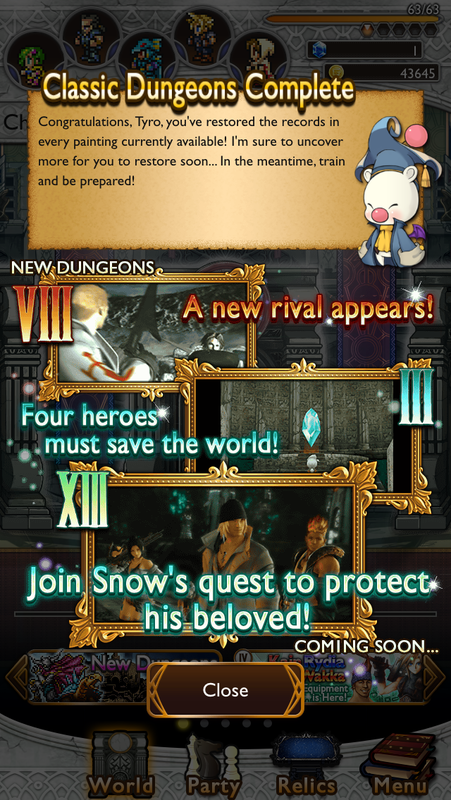 If Final Fantasy Brave Exvius was just Final Fantasy Record Keeper with story, I’m pretty sure I'd be into it. The fun banter between Rain and Lasswell would be amusing enough to keep the fun going for a long time (although I can't see either of them having the time to stray from their mission to collect old Final Fantasy characters). But whether intentional or not, Brave Exvius takes the best parts of Record Keeper such as the console Final Fantasy-like turn-based system and the character collection and combines them with a little console Final Fantasy magic of included a larger variety of attacks available and a proper fleshed out story and makes a mobile JRPG that I want to push forward in to level up my characters as much as possible and to learn more about the world of Grandshelt. I'm not saying anyone has to pick between the two games, but it's what I've done. I get the satisfaction of collecting things from Final Fantasy Brave Exvius along with a story that motivates to keep playing and since I have the advantage of being there from the start of its release, I'll hopefully get to the end of its story soon and will be able to keep up with any updates. I don’t think I’ll ever be able to keep up with a smartphone game as well as I did in my magical first two months with Final Fantasy Record Keeper, but with Brave Exvius I feel like I’m going at a pace I’m happy with and not falling behind. Final Fantasy Record Keeper meant a great deal to me in a stressful time and I’ll always appreciate it for providing me good free fun when I needed it. It was a simple smartphone game that was my own personal simple slice of fun in a difficult time, but it’s not the only smartphone game in the world and I have to respect what I'm having more fun with at the moment. 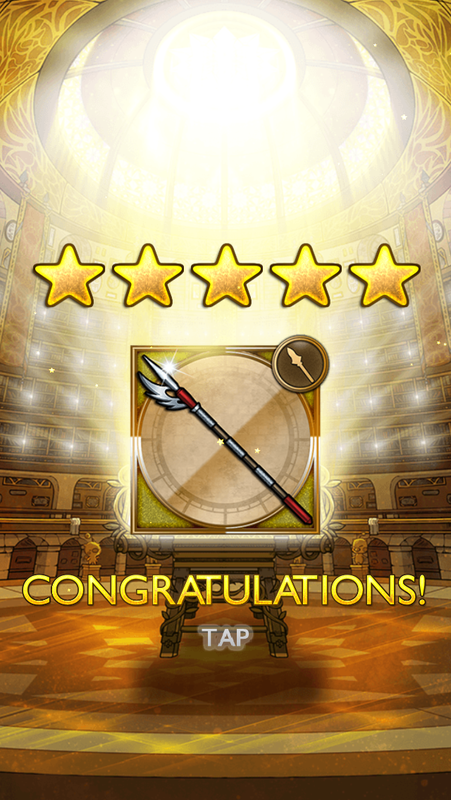 So for now at least, goodbye to my Mythril and my character collection in Record Keeper and hello to new mobile experiences in interesting worlds in games such as Final Fantasy Brave Exvius. Final Fantasy Record Keeper and Final Fantasy Brave Exvius are available in both the App Store and the Google Play store. 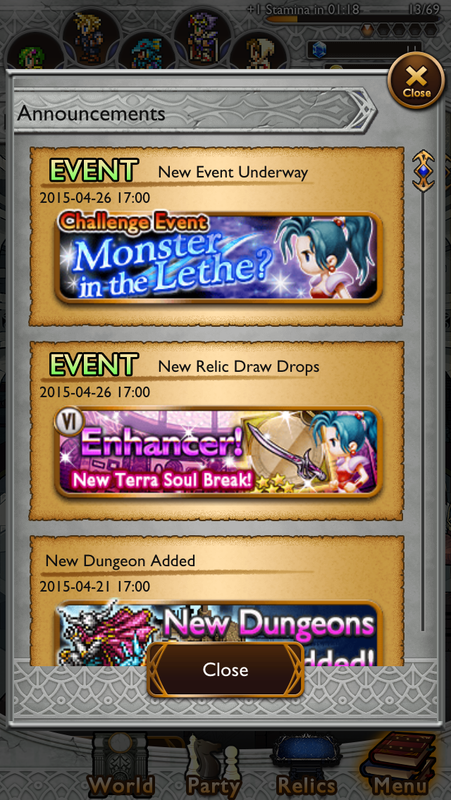 Are you still playing Final Fantasy Record Keeper? What's your favourite Final Fantasy smartphone game? Just like you, I enjoyed Record Keeper until I took a small break from it, then came back and suddenly there was so much new content that it was difficult to wrap my head around things. Brave Exvius does just straight up look like an upgrade of Record Keeper, and I've been having a lot of fun with it. Thank you for your comment! It's interesting to hear someone else went through this. New content is great and all, but definitely hard if you don't have unlimited time to keep up with it.